The most famous attraction in Peru is, with no doubt, Machu Picchu (I have written about the costs of the trip in details here). 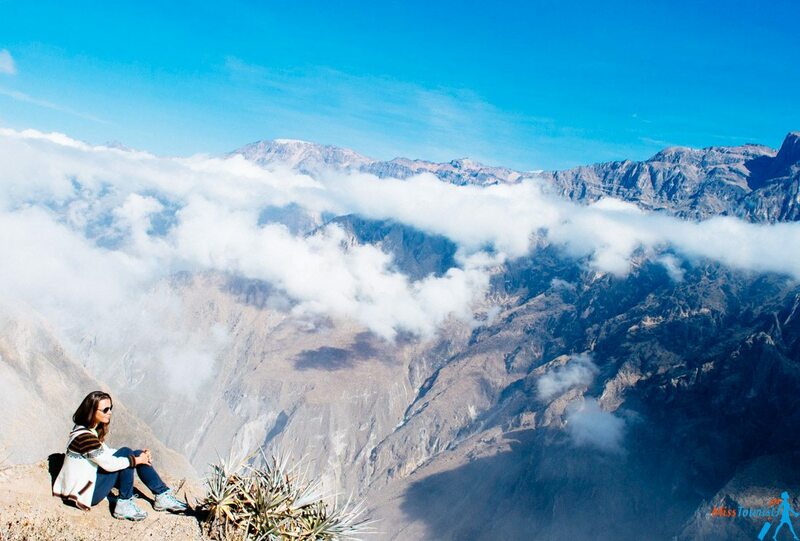 However, there are so many other amazing things to see and to climb, it would be a sin to omit them while in Peru. 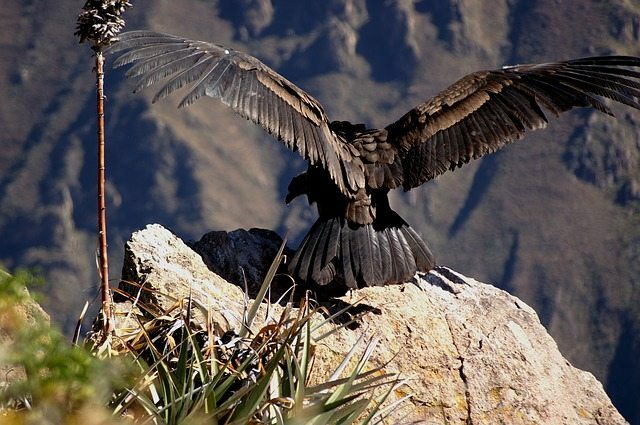 Going through Peru’s natural wonders, I realized I want to have the opportunity to see the condors in real life. Searching a bit, I understood I need to go to Arequipa (second biggest city after Lima), to the Colca Canyon. Arequipa and Colca Canyon, these are the two places I didn’t even know existed before I came to Peru. Why is it so cool and why you should definitely go too? 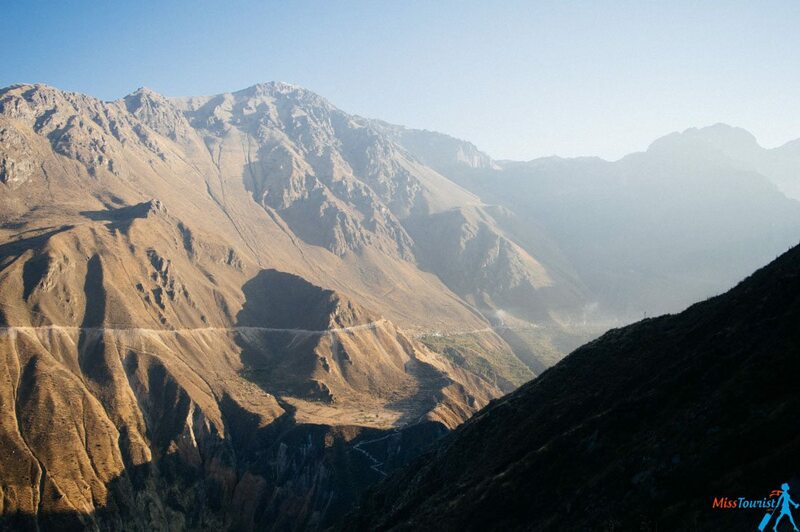 First of all, Colca Canyon is the second deepest canyon in the world, it is breathtaking! 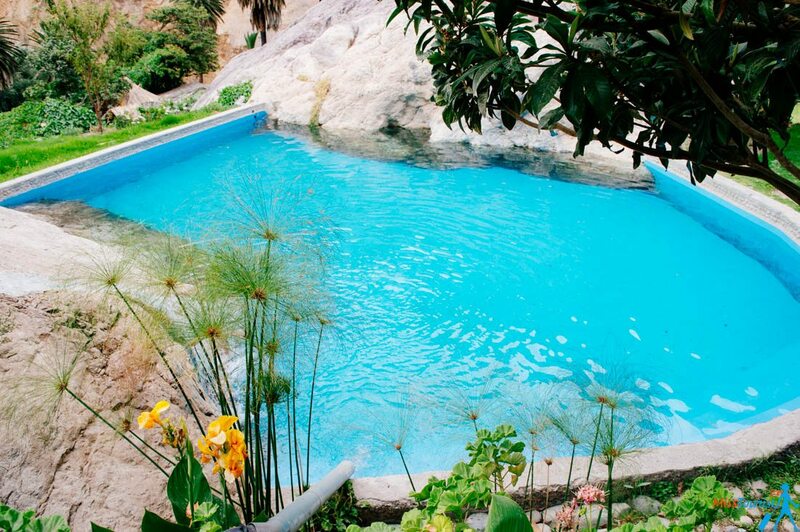 You will be able to see condors, the biggest bird (the biggest flying bird, at least) in the World and will be rewarded after the long hike by a stay in a beautiful oasis. But, my friend, I have to warn you, the hike is physically demanding, you will have to walk uphill a lot! 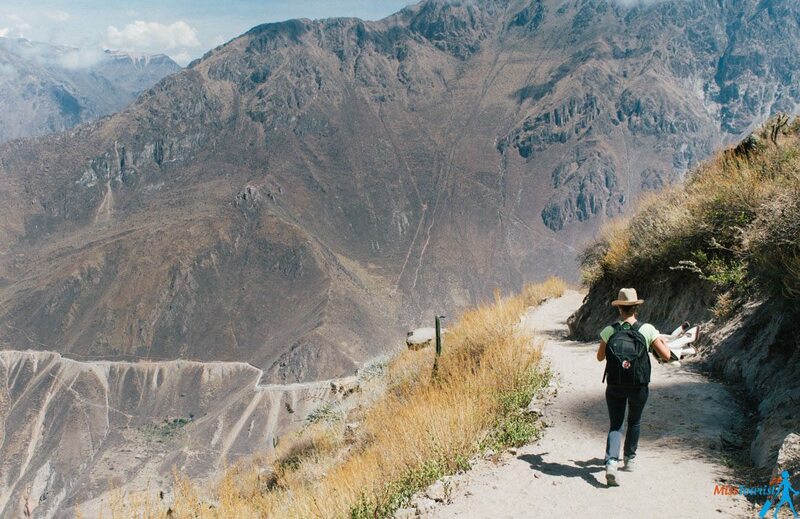 I didn’t really know which tour is better to get to Colca Canyon. 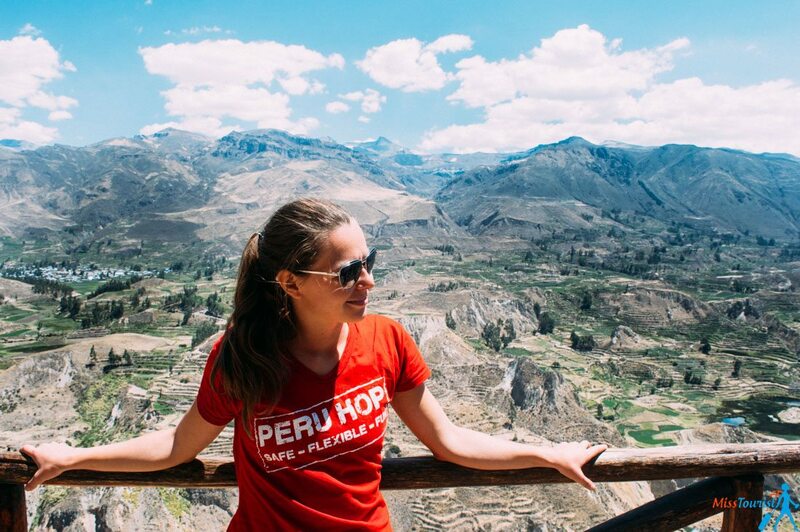 So I asked my friends at Peru Hop what they recommend and they booked for me a local company – they always work with local companies as they try to encourage the local economy. 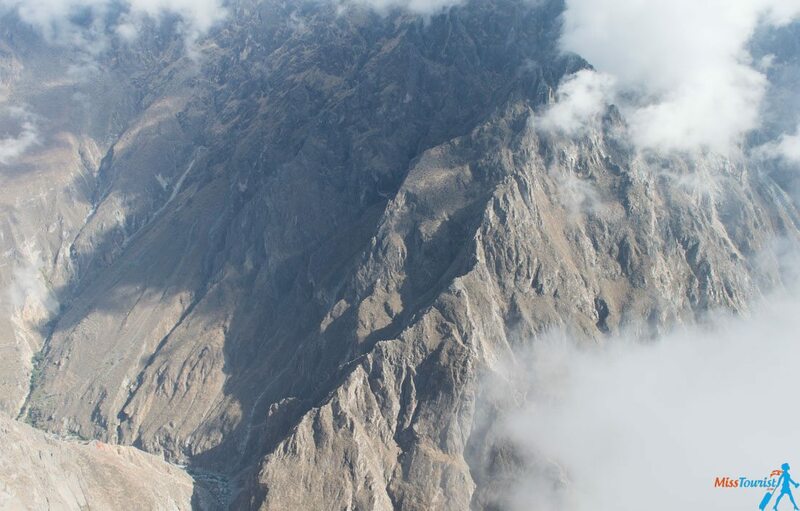 I took a 2 days – 1 night trek, it could have been just 1 day (easy level, no hiking), 3 days hike (probably, more challenging) or even rafting on Colca river. 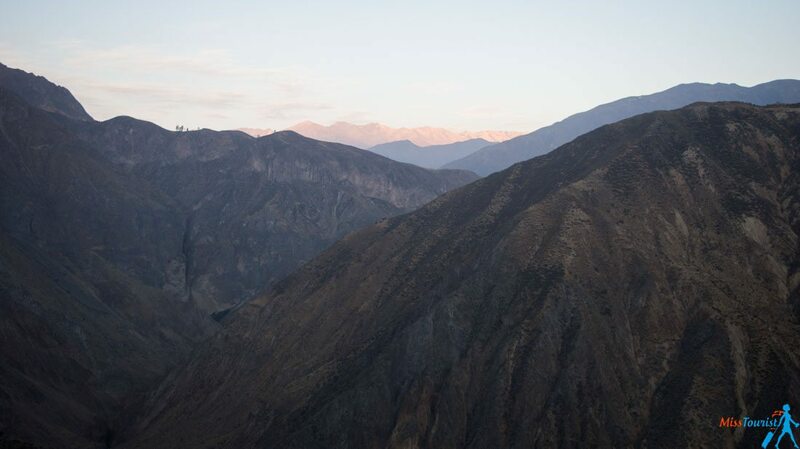 The tour included hotel pickup (at 3 a.m.), transportation to the Colca canyon ( ~ 3h), 2 breakfasts, a lunch and a dinner, accommodation for the night in an Oasis on the bottom of the canyon, and most importantly, the guide. Our guide made the difference, his name was Nelson and I can really say he was great! On the way to the Canyon, we stopped in a Condor crossing view point. We were there for 40-45 minutes and it was enough to spot a few condors. I couldn’t take a good picture of them, but they are majestic! This “little baby” wingspan is 2-3 m., can you imagine? Did you know Condors have a mate for their whole life? People studying their behavior claim that if the female dies, the male commits suicide as he has no longer a purpose. It is both sad and extremely romantic at the same time, don’t you think? During the trek, Nelson, our guide, who speaks really good English, taught us a lot about the canyon and its formation, the differences between canyons and valleys. We got to see, touch, and smell different medicine plants and learn what they are useful for. Peruvians still treat a lot of illnesses with plants and infusions, it seems to work well for them. The first day we covered 13 km. The views were fantastic! Not to mention that all mountains around it are well beyond 5 000 m. The canyon itself is 3 200 m deep by the way. We spent the night in this Oasis, the accommodation was fine, basic, as there’s not a lot of luxury stays in the Oasis. But after 5-7 hours of trek and sun we fell asleep right after dinner. And if I thought the 1st day was quite tiring, I did not know what is waiting for us the next day, huh! Day 2 – challenge accepted! The second day started with a steep hike at 5 a.m. The sun just started to rise and it was cold. But what can you do, you need to finish the hike by 8 a.m. because afterwards it is quite torturing to climb, as the sun is way too strong. The challenge wasn’t easy but it was accepted and I started the ascend. The hike is 2-3 hours long (depending on your speed) and extra weight in the luggage adds a lot of fatigue. I suggest you bring some snacks as breakfast will be only after the hike. I stopped a few times to take some photos, the colors of the morning in the canyon were out of this world! It is really important to have a good fitness level and to pack light. In case you feel like you won’t be able to make it, you can always hire mules. These awesome creature will get you up fast for 15-20$. Two girls in our group did that. Once you are done with the hike (now, THAT was an achievement!) 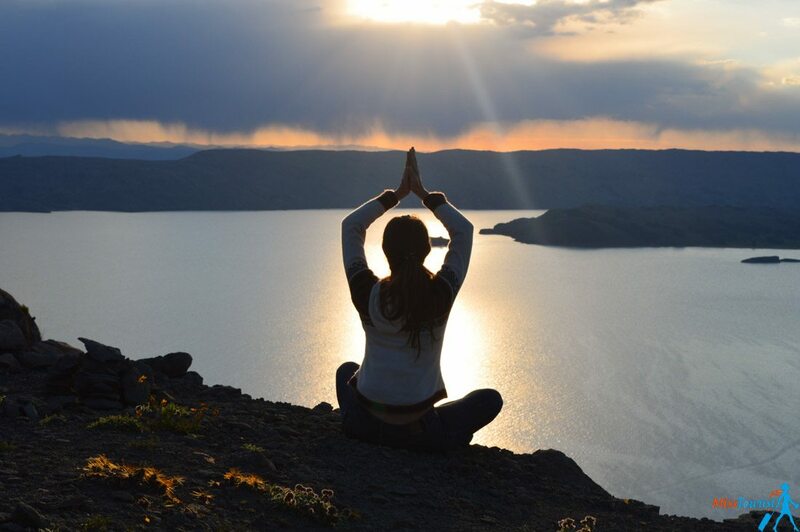 you can finally relax, there will be no more challenges until the end of the trek. You made it, congratz! After nice breakfast our guide stopped one more time to show us the Colca Canyon terraces. 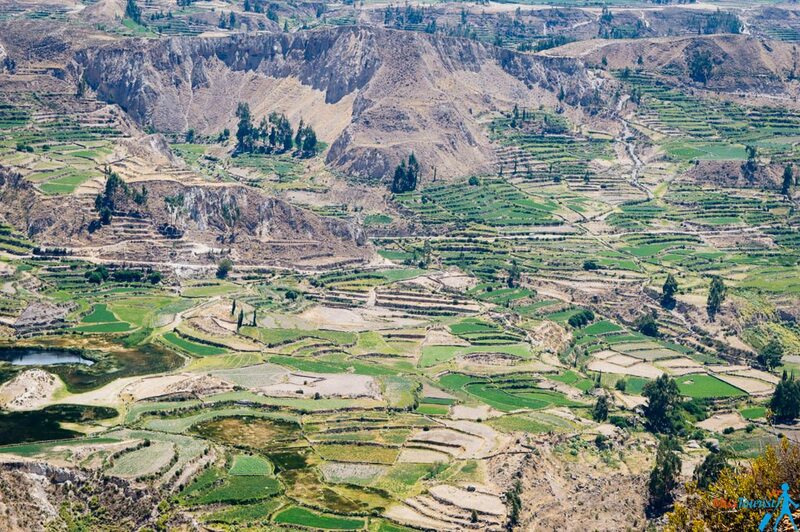 It was and still is the main agricultural zone of the region, and you will see cleverly designed terraces dating since the Inca times ( ~500 years ago) to pre-Inca time (1800 years). People are still using their system to grow potatoes. There are more than 3 500 types of potatoes in Peru, and the potato was introduced to Europe by Spanish sailors coming back from South America! The terraces look amazing, check it out! If you want to relax your tired body after hiking for 2 days, you can do that in hot springs for 15 extra soles. All of our group opted in for that option. We had no regrets, so relaxing! On the way back to Arequipa your guide will show you some of the big animals of Peru: alpacas, llamas and vicunas (which are very cute). PRICE: if you book through Peru Hop, the cost is just 45 US$ for the 2 full days. NOTE: you need to be in shape, especially for the day 2 uphill hike. EXTRA COSTS: snacks, drinks, hot springs and the lunch the second day, entrance to the National Park (70 soles). Overall, my extra was about 20$. DISADVANTAGES: not sure why wouldn’t they include the “optional” choices into the price. It is not like you are not going to have the lunch on day 2, right? Also, I felt like the amount of food was not always enough, so bring your snacks, just in case. 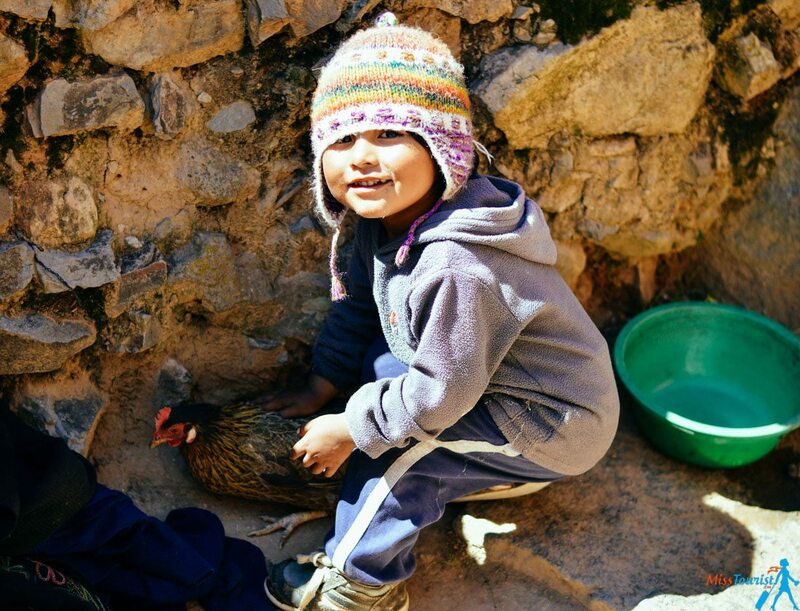 ADVANTAGES: Colca Canyon was maybe the best thing I have done in Peru! Challenging, but beautiful and just great experience. Fantastic views, condors for the 1st time in my life, deepest canyon in the world, super knowledgeable guide. 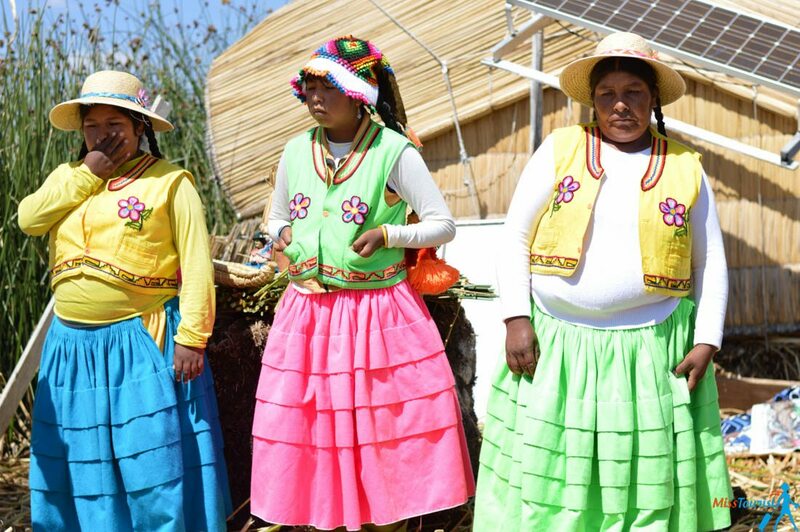 I stayed in Arequipa for 2 days before and 1 day after Lake Titicaca tour, both times in Hostal Solar. I am not sure if they have shared rooms, but generally, they have normal double and single rooms, so it is a hotel. Hostal Solar is located quite close to the main plaza (Plaza de Armas of course). The rooms are neat and pretty. My next trip was to Puno, at the border with Bolivia, and thanks to the wonderful staff on the front desk, I was able to figure out all the ambiguous information about the buses. 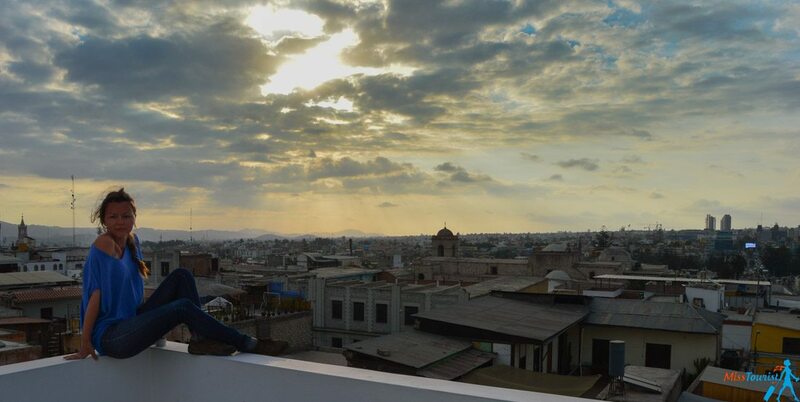 Overall, the stay was very pleasant, I can totally recommend this place for when in Arequipa! 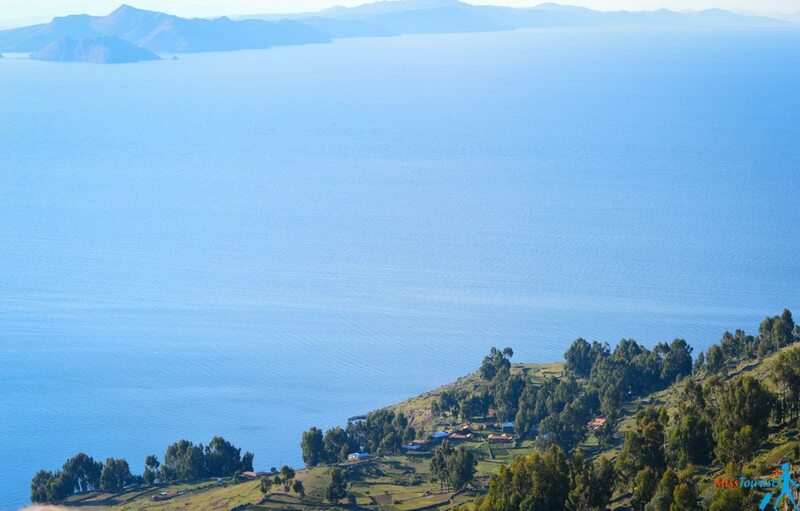 The highest navigable lake on Earth with a funny name Titicaca (meaning Grey Puma in Quechua) was on my list since 16 years old when I learned about it on geography lesson. We were all giggling about its name in school, but I was allured, mesmerized by it. Located somewhere between exotic Peru and Bolivia, it was a pipe-dream for 16 years old me. But dreams do come true and I of course could not miss a chance this enormous 260 km wide lake while on my South American trip! 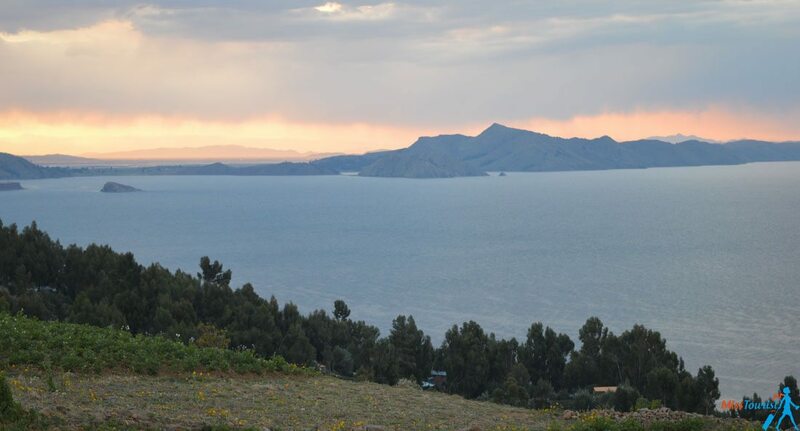 2 days tour to Lake Titicaca with a home-stay in a real family. I was picked up in my hotel in Puno at 7 30 a.m. and we went to one of the floating islands where were we were shown how this type of islands are built, their houses, how they cook etc. These islands basically appeared out of nowhere and yes, they float! People cook, go to schools and do all other normal types of activities there, incredible! Then we took an (optional) boat ride to another island where I both some snacks. By the way, I recommend doing that in advance as the foodstuff is quite overpriced on the island. Finally, we arrived to the “Homestay” island. 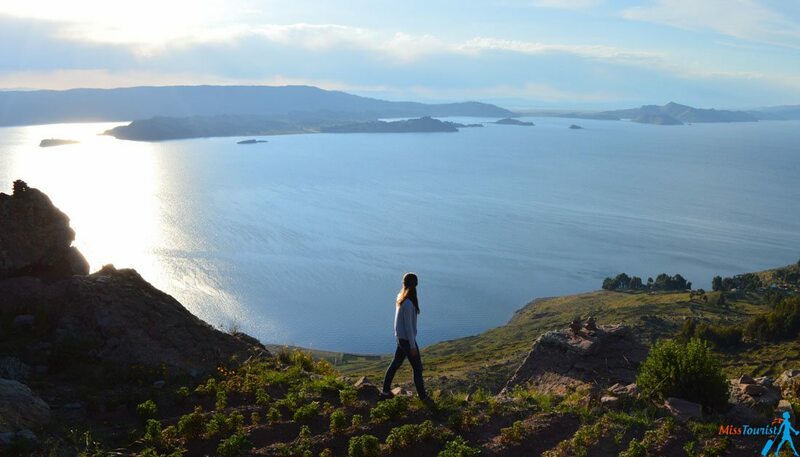 It is quite a big island (Titicaca standard-wise) with 4500 inhabitants. My host, a woman called Luisa was already waiting for me. Expect to speak at least a couple of words in Spanish (or anybody with you) because the locals obviously don’t speak any English. Santos, the husband of Luisa, told us a little bit about how they live and how the tourism helped them. It was an interesting talk and I learned a lot about the local life, something that you don’t see in big cities like Lima or Cusco and you would not get a chance to see here if you would be staying in a tourist hotel. The rooms was basic but clean. Please note that the toilet is very simple and you will have to flush with the bucket. Afterwards we had a lunch (completely vegetarian as the family can’t afford meat). 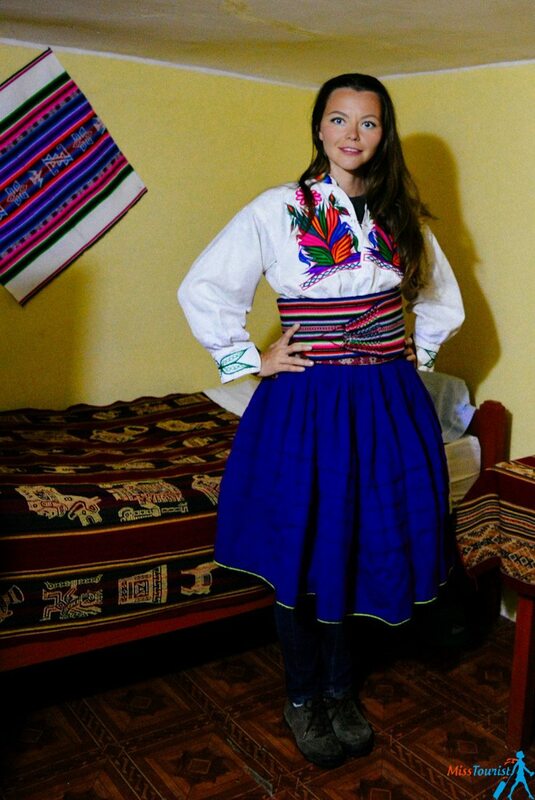 To complete the evening, after dinner Luisa brought as some traditional clothes. And, dressed up, we went to a “party”. Don’t expect to have Beyoncé or Snoop Dog singles there, all the music is very local! NOTE: Be prepared to leave some tips, because these people live only on tourism and it is inevitable they will ask you for that and try to sell you their handcrafts. I did not buy any souvenirs from them as my South American trip was 5 months and I tried to travel as light as possible. We, however, bought some food for the family, but it is not obligatory. Overall, even if it was touristy and I felt like I was expected to tip, I do recommend the tour because I would never be able to see how this people live and experience this without taking the tour. EXTRA PAYMENT: tips for your host family, music band etc., touristic boat, snacks, drinks?, lunch the second day. About 20$ extra. 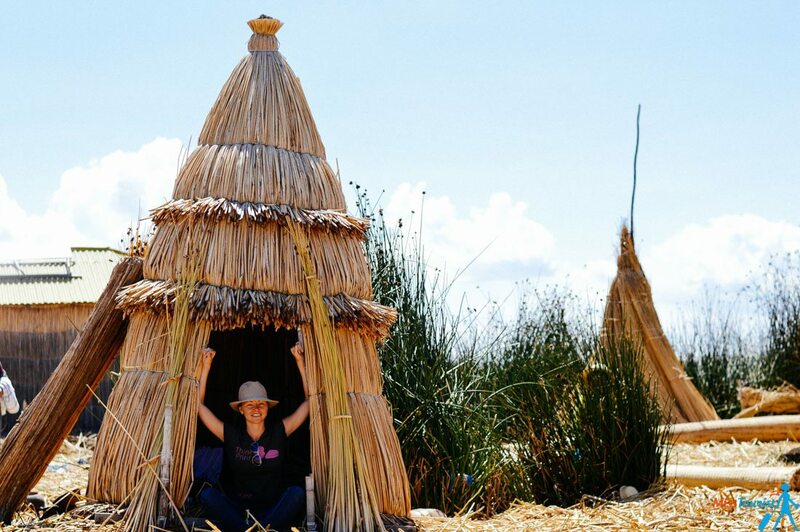 ADVANTAGES: truly unique opportunity to see how locals live, authentic experience. You would never get into their houses otherwise. Bilingual guide. Numerous things to do in Peru except Machu Picchu, you can easily stay for 1 month actively discovering new stuff. 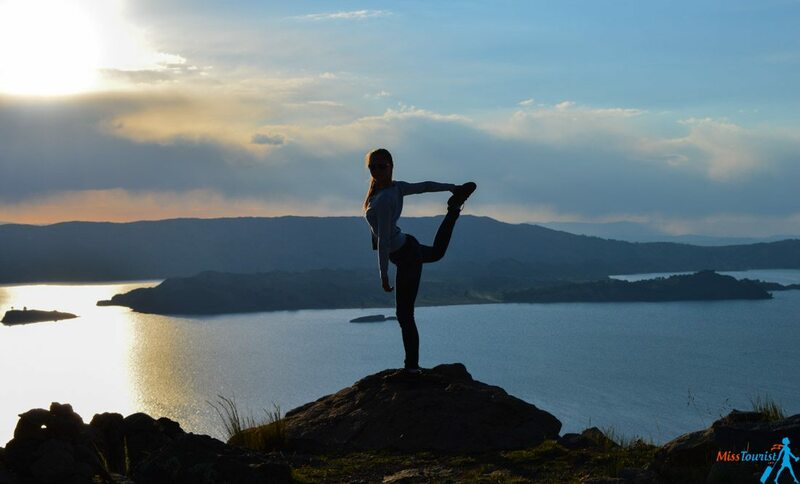 I have described 2 tours that I have taken personally – Colca Canyon and Lake Titicaca homestay. Machu Picchu is absolutely gorgeous, but if you want to see more, there are plenty of things to do. These 2 tours being the best of them in my opinion. Get our of the city a bit and get moving! One step at a time you will reach your goal at the end ;). Which of the trips would you take? Excellent Post! I loved visiting Peru. It’s such a beautiful country! Ya, amazing post. It’s really a beautiful country. I am planning my next trip to Peru. WOW….!!!! IT IS A GREAT DESCRIPTION ABOUT PLACES YOU CAN VISIT IN PERU , ALSO I WOULD LIKE TO RECOMMEND TO VISIT THE RAINBOW MOUNTAIN AND LARES TREK , THOSE ARE QUITE NEW TREKS AROUND CUSCO. 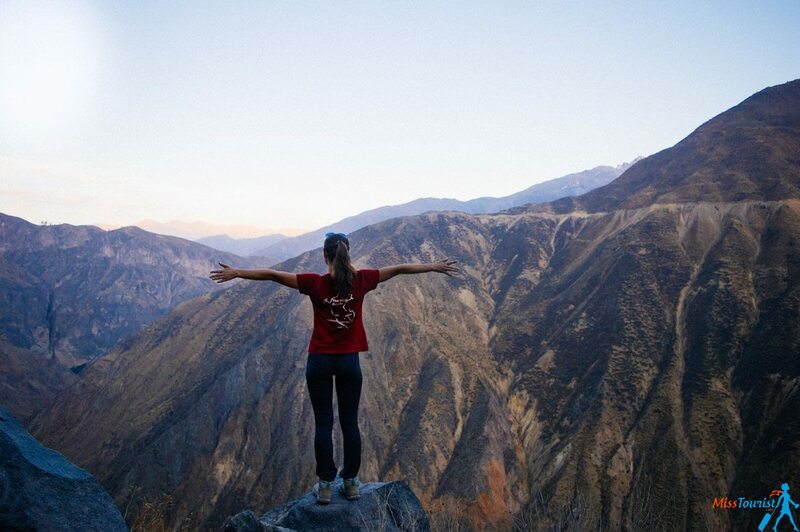 Which company did peru hop book for you to do the trek through colca canyon ? Was the accomodation ok in the canyon (sleep and eating) ? We are thinking of booking them as well. No idea what was the local company, I booked it through Peru Hop. I hope they changed it by now though, it was a one time thing they try to cook some soup or something of that sort that was uneatable. The rest was fine. The breakfast starts late, after you do the climb, so it makes sense to take some snacks with you. Great Post, Yulia. Really enjoyed reading it. I just got back from my Peru tour and I also visited the Colca Canyon, what a beautiful trekking tour! 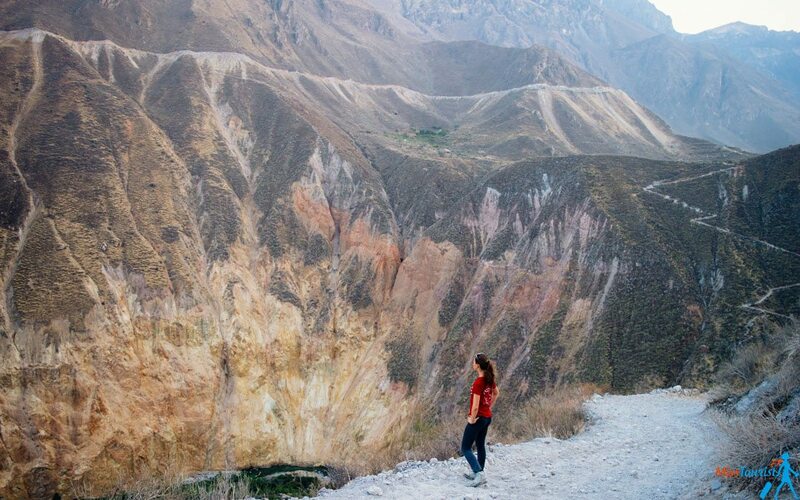 🙂 After that, my favorite tour was the alternative tour to the rainbow mountains in Cusco. Instead of hiking for 3 hours as you do on the Vinicunca trek you only hike for around 45 minutes. Even better was that we didn’t have to get up sooo ridiculously early as the Vinicunca tours at 2:30 am because we left Cusco at 5:00 am. There was almost nobody around us, maybe like 5 other tourists..that was incredible. I did the tour with exploorperu, a local Peruvian travel company and they were really awesome 🙂 Hope you can tour this tour as well if you get a chance to come back to Cusco at some point. Cheers!